I was going to wait and be patient to reveal these two covers, but despite the fact that TWELVE DAYS OF FAERY is still two days away from release, I needed to upload the cover for FIRE IN THE BLOOD to make preorder available on Amazon; and I really wanted to add the cover of THE FIRST CHILL OF AUTUMN to my NaNoWriMo page ‘cos it’s so pretty. So, since they’re out there already, I thought I’d better hurry up and do a semi-formal cover reveal. 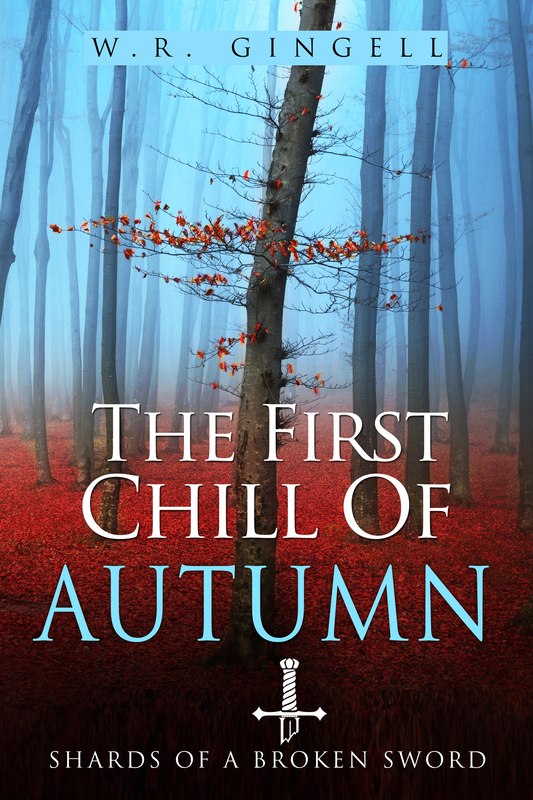 FIRE IN THE BLOOD is the 2nd novella in my SHARDS OF A BROKEN SWORD trilogy, and THE FIRST CHILL OF AUTUMN is the 3rd. Let me know what you think of them! Cover. Already done! I know, I know, it’s not writing, but I like to go gloat over it every now and then. It bolsters me. And it’s so flamin’ pretty! Outlining. I do not outline. Never. Ever. Except with this novella trilogy. I tried it out as an experiment for TWELVE DAYS OF FAERY, and it worked out so well that I’m going to do the same with the second and third novellas in the trilogy. I didn’t stick to it exactly (I used a few different methods of murder than I’d planned, along with other small differences) but it made things so easy that I’ve had to do very little in the way of structural edits. It helps that the novellas are only a third of the length of what I usually write. Stickers. THIS IS VERY IMPORTANT. My stickers are utterly, totally necessary. I get one sticker on the calendar for every 500 words I write. In fact, I’ve had to order MORE stickers because I went through so many, so quickly with the first novella. I love looking at the day’s box and finding it absolutely stuffed with glittering gold stars. They’re even more effective than chocolates for bribing myself. Beaut Beta Readers. I seriously have the best beta readers. I also have the best alpha reader. Okay, so my alpha reader is my sister. But she doesn’t let me get away with mistakes, and she points out REALLY useful stuff. Not to mention finding all my spelling mistakes and missed punctuation. Lately, she’s also been able to point out when sentences are too long/convoluted/confusing. It’s wonderful! And she has to do it cos I’m her sis. Win/win! My beta readers are the other members of my exclusive cough*small*cough writing group. They help out with stuff like weird comma placement, bad word choices, and character development. (Plus so much weird conversation when none of us feel like writing). I may not always agree with them or take all their suggestions, but they’re an integral part of my process. It would be a huge mistake to run any kind of project, NaNoWriMo or otherwise, without planning on edits, feedback, and revisions. Well, that’s my planning. What have I missed? What do you guys do? And who else is planning on taking advantage of NaNoWriMo? 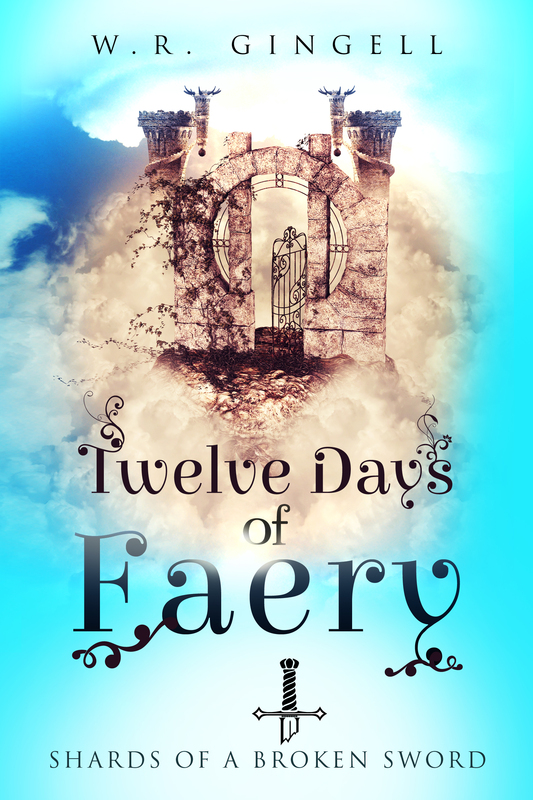 P.S: TWELVE DAYS OF FAERY, the first novella, is currently available at the Amazon store on a Preorder Sale for 99c! It’ll be out October 30th, and will go up to $1.99 thereafter, so get it while it’s cheap! Normal Service Interrupted: Or, Holidays! Okay, I’m probably laying it on just a bit too thick. If you did happen to notice that my blog post was a little (okay, a LOT) late, the reason is as follows: I’M ON HOLIDAY! That’s right, I’m on holiday in the land of the Hobbit, aka, New Zealand. I have not thus far seen a hobbit (must remember to complain to management about that) but I have seen an awful lot of utterly gorgeous scenery that could have come from anywhere in Middle Earth. I don’t think I’ve ever fallen in love with a place as quickly as this. I would move here if I had the money. Heck, I’d probably move without it. We’ve spent our first two days at the Heritage Hotel in Auckland: a lovely experience that has honestly thrown me a little. This is mainly because I’ve never stayed at a place with room service and concierge parking and a little man who offers politely but firmly to carry your baggage and does indeed carry your baggage for you because YOU ARE A GUEST, MA’AM. It’s delightful and rather terrifying. The room itself is quite lovely, too: large enough to be comfortable and elegant, and small enough not to lose ourselves in. Ostensibly, this trip is because the Hubby and I have been married for eight years. It’s our anniversary today (which both of us remembered this year – hooray!) and aside from quarreling in the car and driving the poor SatNav lady burko, we’ve been doing an immense amount of driving. We were both very surprised to find that once we left Auckland (in fact, immediately upon leaving Auckland) we were in Middle Earth. I’m not even kidding. Rolling green hills, beautiful scrub land, country fences that you could see Samwise and Frodo clambering over in their quest for the ring. All equally wonderful and accessible. The problem was knowing when to turn around and head back, because we didn’t want to stop driving. We’ve also done a fair bit of walking around Auckland, which has a thriving nightlife and some really very interesting drunks. The stores are all open to ridiculously late hours, so we never felt unsafe, and almost everything was well lit. There are roughly 50 places we could choose to eat tonight, all within a block or two radius of this hotel. In fact, the hotel even has it’s own restaurant. So where do you think we’re eating tonight? Give you three guesses (HINT: it’s room service). Tomorrow we’ll head off toward Hobbiton (or at least the Northern half of it) for a tour, and from thence to Rotorua, where we’ll spend two days hiking and mud-bathing and driving out to explore the Taupo National Forest. I’m determined to end up with a hobbit sword. Okay, maybe all I can afford is a pint of something at the Green Dragon. BUT I’LL STILL BE IN HOBBITON, SO THERE. So far, the only thing I haven’t done is write. 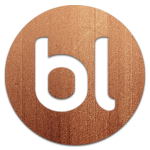 I have not written a word of Blackfoot, my new WIP. Shame on me. Shame on my goat. Shame on the corners of my house. I guess I better get some words down before room service comes along with my scotch fillet. I’m thinking of trying a slightly different approach with this WIP (more planning, scary!) a la Patricia Wrede’s Post It Notes Method. Wish me luck! And if you don’t hear from me so much on the Twitter and the Facebook, it’s not cos I don’t love you, it’s cos I love New Zealand more. Posts should be more or less regular as of next week, for those who really were pining (sorry, mum!). Last night the hubby was watching Caprica. You may be wondering what that has to do with Spindle – or last edits, if it comes to that. What it has to do with both is precisely this: I can’t stand Caprica, or for that matter, Battlestar Galactica. (I’ll have to try the original series- I hated the new V but love the old V). It’s nasty, grotty, by far too soapy for my taste, and I don’t think there’s a single character I like. As far as I’m concerned, the Cylons can eliminate the lot of ’em. So while hubby was watching Caprica, I put on my big, white noise-blocking earphones and searched Youtube for Stuff. I found Lindsey Stirling, which I binged on for a while as I typed away madly at the last few thousand words of Spindle. Then I changed to Evanescence for a while and continued to type away madly. It was probably the easiest, most profitable night’s writing that I’ve done in quite some time. Honestly, the hardest bit was not looking at the music videos as they played (Lindsey Stirling in particular has such lovely, visceral music videos – see Roundtable Rival for my favourite). I did cheat a few times, skipping ahead to other scenes when I got stuck with the one I was writing, but the writing got done. 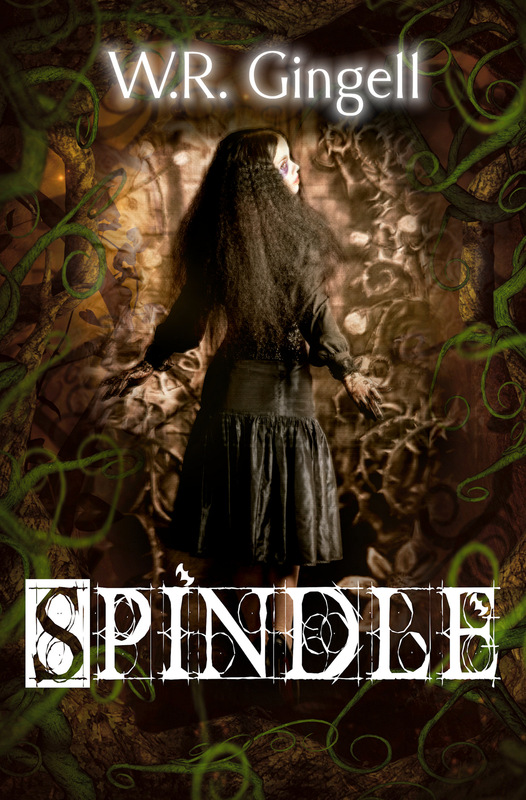 Which means I’ll be able to send Spindle off to beta readers at the end of the week. Hoots! It also means that I’ll have a two week break from the MS while I go on with Other Things and prepare for Final Edits. Fortunately I do a lot of editing as I go, so only the last third of Spindle will need a second and third round of edits (hopefully). That and the feedback from my beta readers should keep me busy for the next month after my break. So in celebration of Spindle reaching Final Edit stage, I have another small excerpt for you all! Enjoy, and don’t forget to preorder Spindle. Poly woke the next morning to uncomfortable heat and a distinct feeling of claustrophobia. To add to her discomfort there was a tiny, sharp elbow digging into her neck, which suggested that Onepiece had turned boy some time after he curled up on her pillow but hadn’t moved from the pillow. One of his legs was dangling over the side of the bed, but the other had managed to work its way under the covers. The rest of him was wrapped snugly in what seemed to be . . . hair. “Good grief!” groaned Poly, giving up the attempt to lift her head from the pillow after one painful effort. Onepiece stirred and murmured: “Tosh,” but that was more likely to be because it was his favourite word than because he’d understood Luck. Poly was left wondering if she agreed with the sentiment. “How does growing keep the curse at bay?” asked Poly. She’d given up trying to explain yet again to Luck that she didn’t have magic, hadn’t had magic, wouldn’t ever have magic. His reiteration was insidious enough that Poly thought she might just come to believe him, in the end. That’s it from me! What have you guys been up to this week? And what is your writing music of choice? Wolfskin will be going on blog tour from July 6th, so reviews are welcome any time from May 1st through to July 26th. Later is fine, too, but I’d love to co-ordinate everything together if possible. If you’re interested in having me as a guest on your blog during this time (guest post, interview, excerpt, etc) feel free to contact me by the above methods. I will also be setting up a Goodreads Giveaway mid-May. See below for a blurb of Wolfskin, and if you’d like to check out an excerpt, click on the Excerpts tab. It’s been a busy week. And now that I’ve written the word ‘busy’ five times, it’s looking really weird to me. Maybe I need a nap. It’s been a busy week. My proofs for Wolfskin came in (finally!) but since they’re late arriving I have only a week and a half to check and correct. So there’s that. Then there’s the last 5000-odd words of Spindle that need to be done by next week if I want to keep on target with that particular deadline. And then there’s Memento Mori (the second volume in the Time-Traveller’s Best Friend series). I’ve only just begun it, and though I know roughly what the story arc for the collection will be, and have a few titles and ideas for a few of the stories, I still need to write the thing. By August at the latest. With all these deadlines, you’d think I’d be madly at work on one or all of them. No such thing. I also got a new idea for a Short Thing for Weekly Fiction’s Open Call For Submissions. Naturally, I started work on that, with a little bit of editing and proof-reading around the edges. Fortunately, Wolfskin is proving much less complicated than Masque was. I seem to have caught most of the errors and inconsistencies and missed words before this point (does that mean I’ve advanced a level? New Power! Error-Free Gained!) and it’s really mostly a matter of a tiny change here and there. Added to all the above is a busier-than-usual week at work, coupled with an annoying surge of my favourite companion, Meniere’s Disease. I may just quietly go mad for a while. Don’t mind me. It’s a self-chosen madness after all. What about you guys? Who else has a murder of deadlines? (Well, what is the group word for many deadlines, anyway?) And are you actually working on them? Wolfskin is on its final edits and will be published May 1st, 2015! It’s set in the same world as Masque but is a standalone novel with separate characters. I will hopefully be doing a blog tour a month or two after publication, but in the mean-time, here’s a short excerpt for you to get a feel for the book. When I stepped from the thread to the path leading to Akiva’s front gate, there was a woman between me and it. She was so beautiful. I’m not sure why I expected her to be otherwise. 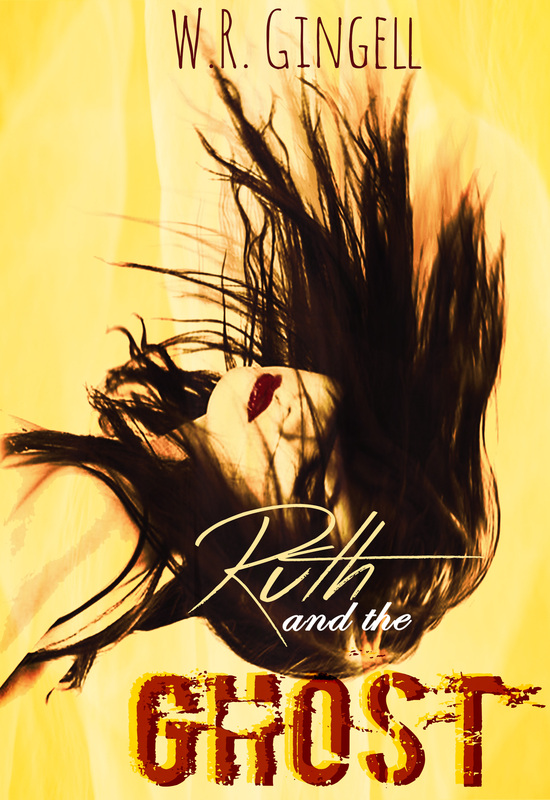 Her hair was black and glossy, and hung loose to her waist in a sleek, rippling sheet that mingled with royal purple satins and silks that were as sleek as her hair. Her eyes, framed by impossibly long, dusky eyelashes, were of an equally impossible shade of violet. I saw them and my herbs scattered themselves on the path, dropping heedlessly from my nerveless fingers. Those twin violets gleamed with the same darkness I had seen in Bastian’s eyes the first time I met him. Horned hedgepigs! I thought, swallowing. It could only be Cassandra. Her voice was bell-like in consideration; and, like every other part of her, breathtakingly beautiful. “I know,” I said. Even if I had been as beautiful as Gwendolen, I couldn’t have hoped to compare with Cassandra. I eyed her unblinkingly, wondering why it mattered to her. “I don’t know what you mean,” I said, scowling. I was coldly frightened, and that made me angry. Black, tarry magic was stirring around her, creating nasty pockets of corruption in the air that made me feel ill: it was vastly more powerful than anything I had ever seen. “Bastian isn’t here,” said Akiva’s voice suddenly and startlingly. I tore my eyes away from Cassandra’s and saw her, knobbly and infinitely welcome, leaning on a stick behind the enchantress. For a horrible moment it had felt like I was drowning in the brilliant lavender of Cassandra’s eyes. “I can smell him all over her!” hissed Cassandra. Their voices faded with distance, but as I loitered on the garden path I saw the warm glow of an astonishing and formidable power rising to meet and match Cassandra’s. I recognized it as Akiva’s, hale and hearty, and stronger than I could ever have imagined. After that I hurried to get into the safety of the cottage, feeling the hairs prickle on the back of my neck, because I knew that it was no longer safe for me to be out in the open. Once inside, I plumped myself down in Akiva’s chair, absently staring into the fire and contemplating the extraordinary power I had just witnessed. For the first time in the excitement of my new magical prowess, I felt thoroughly humbled and weak. My own power, puny in comparison to that shown so effortlessly by both Cassandra and Akiva, was pitiful past thinking about. I was suddenly very thankful for Akiva’s protection. In the coldness of the moment, I knew there was no chance that I could ever hope to fight against Cassandra and win. 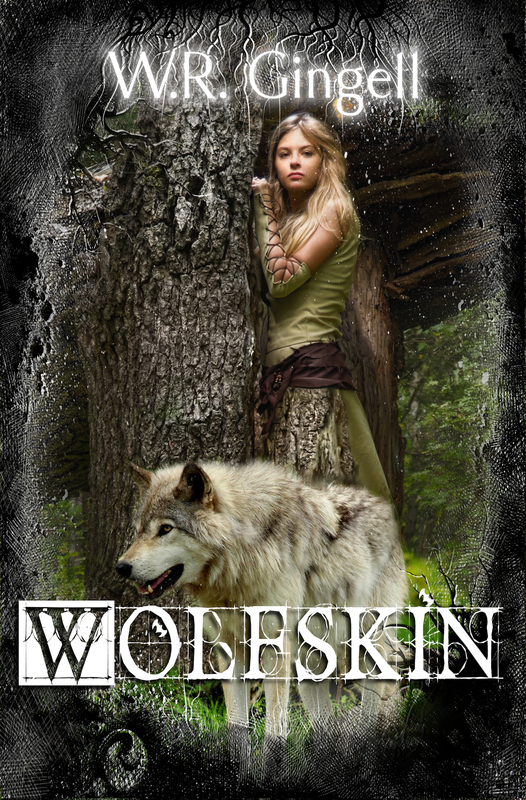 Wolfskin is available for preorder on Amazon and Kobo, due for release May 1st, 2015. As Masque won’t be out for another 15 days, I thought I’d whet your appetite for my Two Monarchies Sequence by giving you a taste of my current WIP: Spindle. You may perhaps be clever enough to guess which particular fairytale I’ve messed with this time . . . Anyone looking for this excerpt after it has progressed down the page need only click on the page Shorts & Excerpts to find it again. Polyhymnia knew perfectly well that she was dreaming. Her hair was in pigtails and she was wearing a smock, which pointed to an age of perhaps twelve or thirteen; and the dream itself was a distant memory of a history lesson with Lady Cimone, her teacher. She had been amused for a brief moment to find herself daydreaming during the lesson: dreaming, as it were, during a dream, while Lady Cimone pointed out the various flaws in Civet’s latest sally against Parras. Oh, I remember this, thought Poly suddenly. Parras tossed over one of our outposts, and we walked right into an ambush trying to retaliate. Pain, in her left ear. Poly clutched the injured member in surprise. “Ow!” She hadn’t remembered that. Poly let her younger dream-self murmur the appropriate response, her attention snatched away, because a gold-edged rift was beginning to form in the blue-painted wall behind Lady Cimone. The lady caught the direction of her gaze and gave a sharp glance behind her. “Bother!” she said. She seemed annoyed rather than taken aback. Before long the perpendicular rift was tall enough to admit a human, and Poly wasn’t quite surprised when a young man stepped through. He was wearing a long, mud-splattered black coat that looked as though it had seen one too many days travelling, and he had an inquiring, dishevelled look. His forehead was wide and square, with dark hair springing upwards and sideways from it, and his mouth was both determined and wistful; though the triangular set of his chin spoke more to determination than wistfulness. Poly shut her mouth, which had dropped open, and took one involuntary step backwards as the man pulled himself fully into the room. He was fairly glowing with residual magic, which set every alarm bell ringing in her head. “Shoo,” he said to Lady Cimone, and stepped purposefully toward Poly. Poly became her normal, older self in confusion, and the dream-memory of the younger her melted away, leaving Lady Cimone and the young man behind in the resulting void. The young man seemed almost as bemused as Poly felt, but Lady Cimone was looking, as usual, serene and omniscient. “But-” Poly began; but Lady Cimone was already gone. Poly put her hands on her hips and surveyed the young wizard, who was still standing where he was, disturbingly real for a dream figure. Poly could have said: ‘I’m not the princess,’ but it didn’t see worth arguing with a dream. Instead, she said: “I don’t think so,” and slipped up and out of the dream. It should have woken her. For a moment, she thought it had. She was standing in her own small, rounded chamber, stranded aimlessly between her bookcases. Through her window-slit the outside world looked sunny and normal. Then she saw the translucent something coating her hands from fingers to elbow, and belatedly felt the odd, sideways pull that had brought her here. “Bother,” she said aloud. The translucent something wasn’t quite magic, but it seemed to be the dream equivalent. In real life, Poly had no magic. It was the one consistent way to tell dream from reality when her dreams became too realistic. Poly wriggled her fingers and the translucency shivered coolly across them with a sense of familiarity. When had she started dreaming about magic so often? In fact, when had she started dreaming for so long at a time? She felt as though she’d been dreaming for years. Time to wake up, Poly decided. She let herself slip upwards and awake, and again found herself sliding sideways to the pull of something strong and unfamiliar. Poly gave a little gasp of indignation and fought against the pull. It was ridiculous to allow her dreams to be hijacked by an unpleasant dream entity of her own creation. Where was it coming from? She dragged herself around in the direction of the voice, feeling the reality of her dream-chamber wobble around her. A nasty quiver of surprise shook her at the sight of the hooded, murky figure that seemed to be more shadow than substance, cobwebbed in the doorway. Too smooth for words, Poly thought, sharp with fear. There was a prickle at her back that made her think the enchanter from the previous level was making his way through to her again. A panicked, nightmare quality had settled over the dream like a wet blanket, weighing her down, and for a brief moment Poly found herself unable to think. “I don’t like you,” Poly said experimentally. The reasonable tone to the shadow’s voice was hard to resist. There was her bed, in the middle of the tower room where it didn’t belong, and Poly felt herself take one step towards it. The sheets should have been cool and smooth when she slid between them. Instead, they were fuzzy and warm, and Poly felt her eyes gum together in the last warning of approaching slumber, the prickle at her back fading in the warmth. “No, I don’t think so,” said the shadow; and it seemed to Poly, mired in sleep, that an impossibly strong magic was stirring in the room – no, in the very air – around her. It was bright, fiery, and entirely translucent. The wizard said: “Yow!” and did something golden and magical with more haste than precision. Poly stirred, fighting against sleep, and saw his face briefly appear above her. Poly tried to say: ‘Get on with what?’ but found that she couldn’t move her lips. It took her a shocked moment to realise that she couldn’t move her lips because she was being kissed. It took another to realise that she was waking up- really waking up. Gold magic fizzed from her lips to her toes, and everything familiar . . . disappeared.